Mark Twain once said, “When one has tasted watermelon, he knows what the angels eat”. “Our growers just plain know how to grow watermelon”. Maybe, it’s because of our rich sandy soil. It could be our mild summer climate. Possibly, it is because our harvest comes during the longest days of the summer (Ole Sol kisses our melons longer than any other temperate zone). The truth is, we believe all of these contribute to making our watermelon, the most mouthwatering and sweetest watermelon in the world. We invite you to browse our web pages and discover the tender loving care we put into each watermelon we grow and just how much fun we have promoting our delicious juicy fruit. Registrations by February 8 to avoid higher price!! Sponsorship/Advertising can compliment your marketing plan. All convention support(program advertising, brochure sponsor, scholarship sponsors, all event sponsors, exhibit booth participants) will be tallied to determine your company’s level of recognition. How we grow our tasty watermelon. From the planting of the seed to packaging, we put TLC into every melon we ship. 8’ x 30’ Table, skirting, and 2 chairs will be provided for exhibit booths. Electrical outlets will be available upon request. Eating Watermelon Has Tremendous Health Benefits! This wonderful summertime treat comes packed with powerful Antioxidants along with several vitamins our bodies need. Watermelon is high in Vitamin C and a good source of Vitamin A through its concentration of beta-carotene. Watermelon is a very concentrated source of the carotenoid, Lycopene. Lycopene has been studied for its antioxidant and cancer-preventing properties. It has been found to be protective against many forms of cancers including prostate cancer, breast cancer, endometrial cancer, lung cancer, and colorectal cancers. Watermelon contains a higher concentration of Lycopene than any other produce item. Watermelon is an excellent source of Vitamin C so necessary for the body's immune system. Just one cup of delicious watermelon provides 25% of our body's daily requirement. Through its concentration of beta-carotene, Watermelon supplies a rich source of Vitamin A, another cancer fighting anti-oxidant along with Lycopene and Vitamin C. A cup of Watermelon supplies your body with over 10% of its daily requirement. Vitamin B is necessary for energy production. Watermelon is rich in Vitamin B6 and B1, as well as magnesium and potassium. Because Watermelon has a higher water content and lower calorie content than other fruits, it delivers more nutrients per calorie. Because Watermelon is exceptionally high in citrulline, an amino acid our bodies use to make another amino acid, Arginine. Arginine is used in the urea cycle to remove ammonia from the body and allowing the production of Nitric Oxide, which not only relaxes blood vessels thereby alleviating high blood pressure, it is the compound whose production is enhanced by Viagra® to prevent erectile dysfunction. 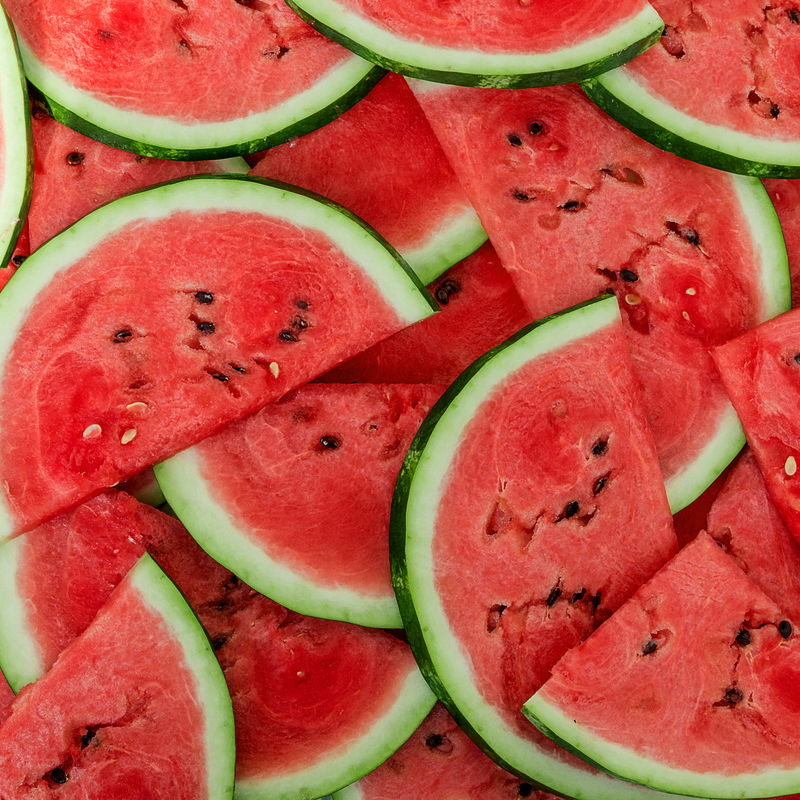 Read this White Paper on Watermelon Extract Supplementation. There is evidence that it reduces ankle blood pressure and Carotid Augmentation Index. Watermelon contains a higher concentration of Lycopene, a powerful cancer fighting agent, than all other type of produce. Each spring we gather a team and participate in our local Relay For Life©. What better way to spread the message of watermelon’s health benefits than to raise money for this great cause. To read more about Watermelon Nutrition and Health benefits, visit The George Mateljan Foundation, for a wealth of food health information as well as wonderful recipes. 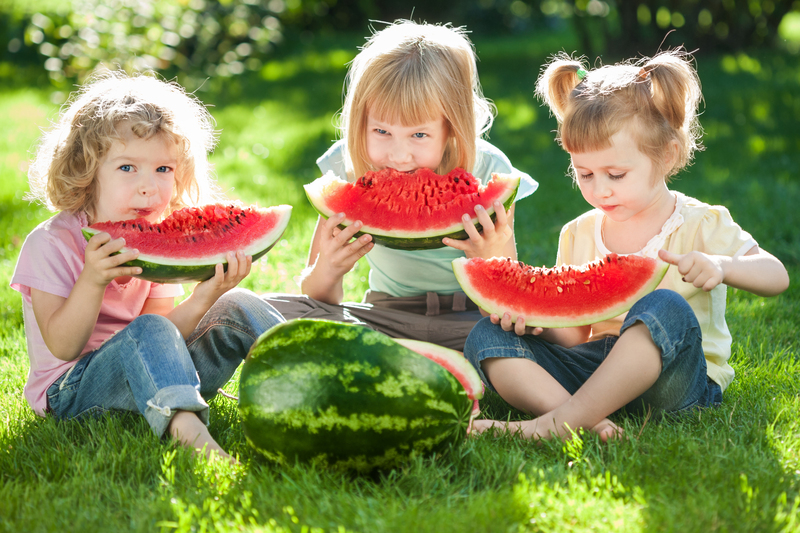 Additional health and nutrition information can be found on the National Watermelon Promotion Board website.